These are her parents - Matt & Morgan - credit always where credit is due!! This holiday season took us to far off places… all via Glassdaddy’s new electric vehicle. Can you imagine driving half way across the country and back for under $70? Funny though - how you drive with the idea that you don’t deplete the battery beyond 30% and don’t charge more than 80%… all the while managing to hit charging stations that will do the work quickly… it was truly an endeavor. I did find myself looking longingly at the real gas stations a time or two!! What I’m loving about this picture is that while she was interacting with my mother - her gaze was distracted by the clear glass of the balls on her necklace. Imagine that if I can grab and hold the attention of this little one, I must be doings something right. I’m lucky in that my mother, Tula, is one of my biggest fans and I know I can always make her one of my creations and it will get worn! The idea of glass and its beauty is celebrated - IMHO - by the removal of the bead hole… I know, you’re tired of hearing this… but it’s so true! Glass becomes the center of attention and reflection. I had taken about 2 weeks off from torching - and can attest to the truth from an old friend - as she used to say - she gets ‘TWITCHY” if she goes too long without torching - I’m definitely feeling it! 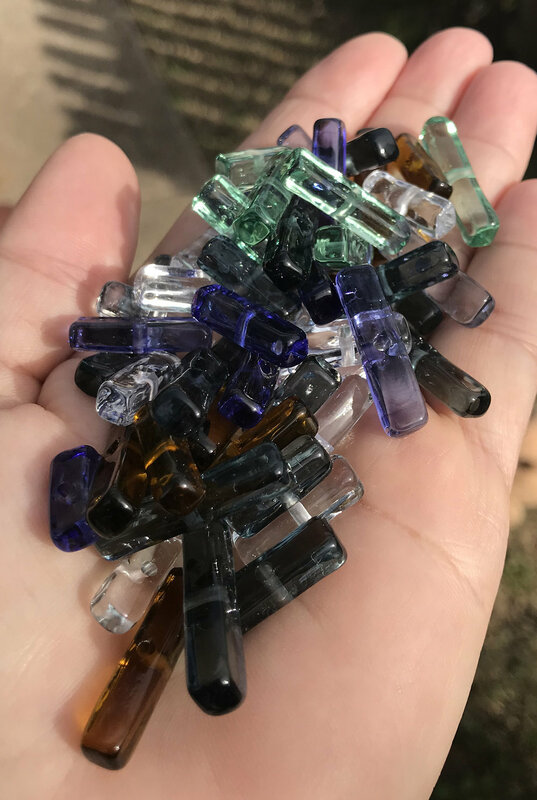 I designed pieces in my mind on the drive and can’t wait to put it down in glass. Last week, I approached an Austin Gallery - Artworks on West 6th Street - about putting some of my work in their gallery - they chose a nice variety and I’m very pleased - as it looks amazing in their showroom! Stop by and see it if you’re in the area - maybe after you’ve scooped up my work - you’ll snag some art for your walls!! Over the past year - I’ve been working up to this - and also - to a level of work that doesn’t scream craft. It’s all about a more deliberate pace - slower and more careful… to get there. The earrings shown above have a mirror finish on the black - top hole will acomodate the loop turnbed sideways - while the bottom better fits it - rotated 90 degrees… the Jetstream dangle bead has only one hole… so when you wear the earrings - you don’t have to see the ‘hardware’ at the bottom of the bead. 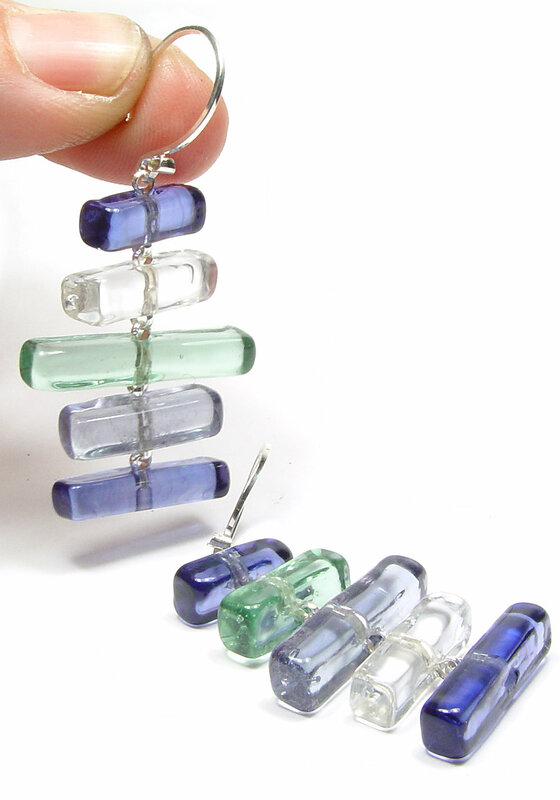 These blue beads are just so awesome… the silvered glass is singing beautifully underneath the silver wire that’s wrapped around it… then I’ve carefully laid a layer of clear on top of the wire/silvered glass. This holds the wire onto the bead (eliminates the need for polishing the bead) and protects the silvered glass’ finish. 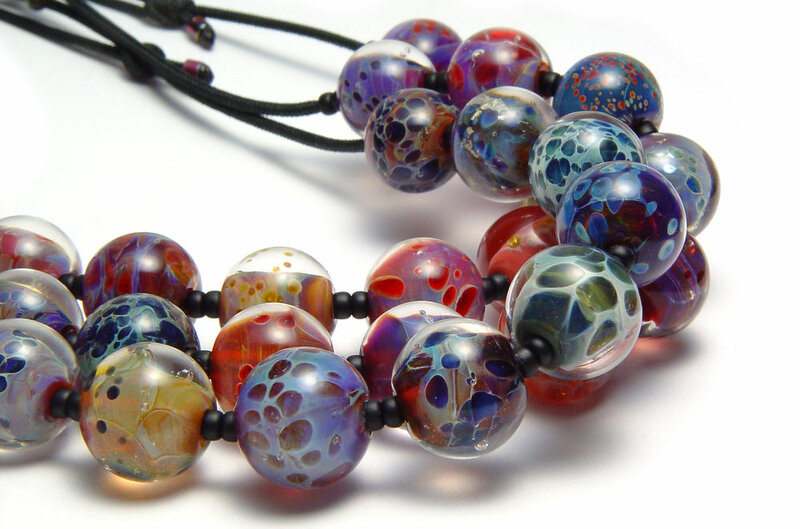 I’ve been making beads for over twenty years… that being said, I make a LOT of beads. But, yesterday this was all that I made. This handful was the results of 6 hours at the torch… crazy, huh? While the idea of a square shaped rectangular bead with a hole in the very middle… can be appealing - let me remind you - glass, through gravity and surface tension wants to always be round… the idea of square + rectangular is crazy, huh? I had a friend suggest that she could see these used this way…. I have to agree, they’re quite wonderful!! Lots of sparkle and independent movement… very wearer friendly earrings! I’ve been making many finished pieces lately - but as usual, have found that it sells better in person… IF YOU are looking for a special gift for the holidays - send me a note - and I’ll try to fit the bill!! 11.14.2018 - New Way of Thinking. So - I had a longtime customer, Barbara Muth, (turned friend - as luckily many of them do!) come visit me on Thursday. We were looking through beads of course and she remarked that she would wear what I considered a pendant as an earring… NAH??? really??? I popped an ear wire on and boom - she put it on and it LOOKED FABULOUS! So - this week, I made it my work to make more!! If one pair is good, then more is “more better”. 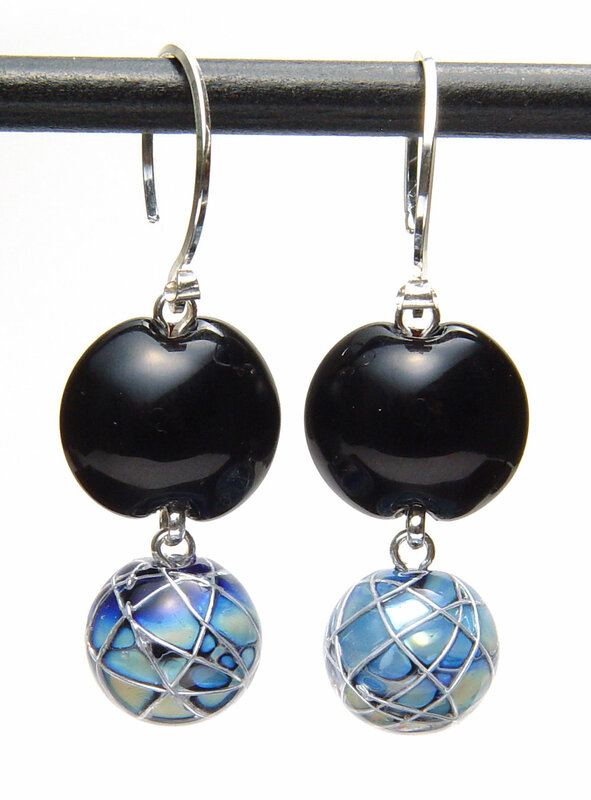 She asked me to make her a pair in this color combo… and I have to admit that they’re pretty stunning!!! Earlier today I was thinking about how often I wear a very simple necklace - it’s my ‘go to’ necklace. So, if it’s good enough for me… I should make more! 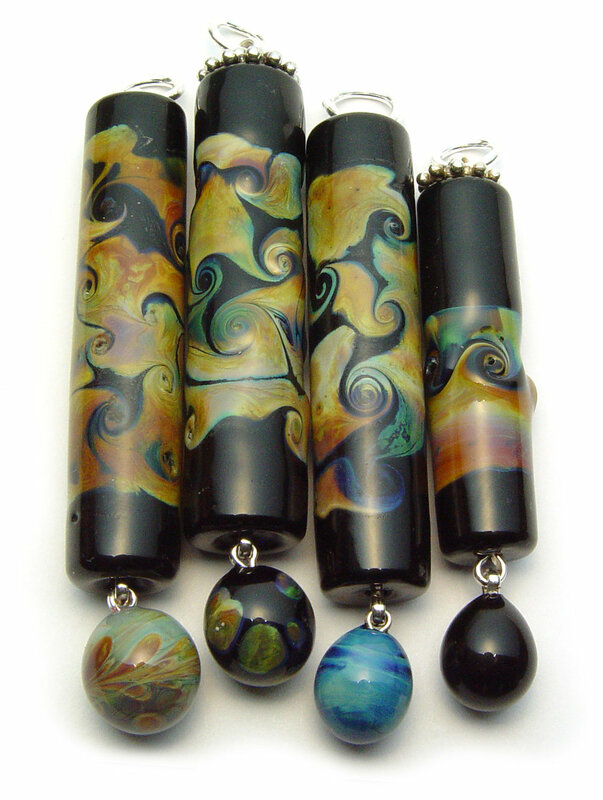 Hi… I’ve been working on gently graduated sets of boro beads - nicely straight sided and smooth mirrored finish surfaces… I feel these are necessary components for a smooth contemporary feel… and I feel this is very possible for lampwork that looks like this. I’m typically not a boro gal… but every now and then I get the bug - and this week I had it. 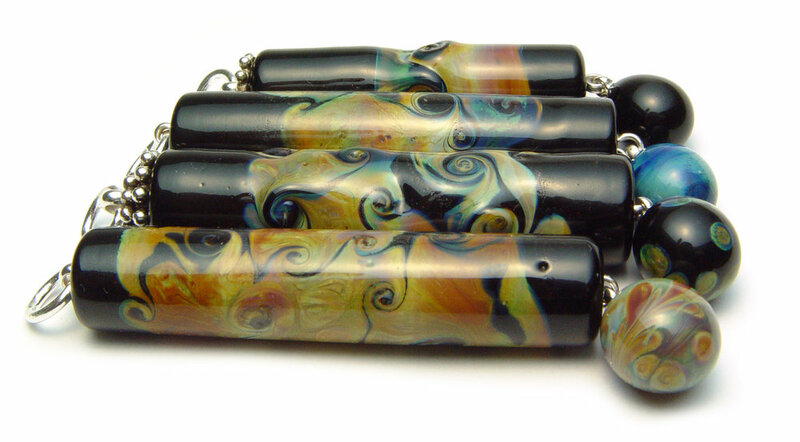 There is now a long list of favorites that I plan to order more of, as sometimes burning that last little nub of glass in your most favorite color, of the moment, can really be hard on the fingers! In the 20+ years I’ve been making beads, I’ve taught as well… I happily will report to you that there seem to be two kinds of students. 1. The impatient one who insists on applying glass that’s not hot enough to the mandrel - then ends up cracking the release and is upset. 2. The one who’s so full of wonder & joy, and who is also patient to a fault. These are the easy ones - as I also have found this week that patience is a virtue… and Borosilicate melts slowly… I enjoyed the evolution of color and the trial of shaping such a stiff glass. Tall, thin, and Texan. I love disks - I feel like that’s my mantra at my support group… I just wish there were more ways to show these beauties off!! I’m working on it. I have these strong feelings about certain things glass related - (as my quest to remove the hole, or at least the visibility of it) and it dominates my creativity. Last week I had the new version of the disk necklace… which lovingly lets the light to transmit through the glass and ‘allow’ the color. But until theres a nicer way to use these pretties with their broad plane of color facing forward… I’ll always be pursuing options. Many of the prettiest color are so color dense - that unless they’re stretched very thin, or veiled over a lighter color - they get lost in the dark. For years, I’ve played with a small footprint of glass and building tall, thin beads… below is a video I made that shows the process… enjoy. 10.3.2018 - Lovely Moo Cards! 9.26.2018 - Midnight in The Garden Focals... snowstorm in the garden? Click below to see the video from the torch - it’s only 5 seconds - but it’s interesting to see these as they’re created. This focal reminds me of perhaps flowers in a snowstorm… but, in all reality, (especially in TX) that’s not too possible. This is one of my larger focals - long/balanced and slender. Are you like me? Do you take a new idea and do it to death… in all colors - variations and such until you and your viewing audience are totally saturated? Sometimes that’s what it takes to get to a point where you’ve addressed all the issues. ALL the issues. As you know, I’ve been on this quest to get rid of the bead hole - as I gravitate towards transparent glass I often feel that hole meandering right through the middle is a distraction… from the perfection of a near bubble-less creation. I don’t work often in clear/colorless glass, but the Lauscha is so darn wonderful… I couldn’t resist. It started with a tiny drop of glass no bigger than 1/2”, I played with various ways to create this on or off the mandrel. Then they got bigger as my confidence grew…. until, that is, I realized they were too large. I slimmed down the earrings, perfected the profile and found a way to be able to consistently handshape these earring beads - and have nicely matching pairs. I’m finally satisfied and can now just produce… I’ll meander off somewhere and obsess about something else. 9.5.2018 - Yes - I'm still here. Hello - I'm still torching - and creating, just having trouble getting it translated and onto the site! 8.15.2018 - Its all about the Weather...Little Lines of Glass. Then there's the harvest and the angry skies..... This type of transfer doesn't happen that often, and I don't usually become too literal in the representation of things on my beads. But, this just happened - these are the "Harvest Series". Then we have the rains in the Northeast.... and some crazy Texas rain... More crazy angry clouded skies and downpours. I love the size & simplicity of my canvas - and the easy portrayal of events as simple as weather - in little lines of glass.